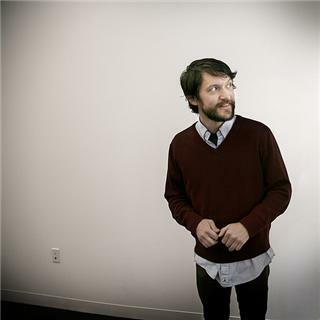 Tim Kasher (born August 19, 1974) is a musician from Omaha, Nebraska, and is the frontman of indie rock groups Cursive and The Good Life, both of which are on the Omaha based record label Saddle Creek Records. Prior to those bands, Kasher was in a band called Slowdown Virginia. He also made a brief appearance with the Omaha band Commander Venus and The March Hares. Kasher has a very close relationship with Conor Oberst of Bright Eyes. They grew up in Nebraska together, went to the same Catholic high school, Creighton Prep. In the Bright Eyes song "Nothing Gets Crossed Out," Oberst sings, "Tim, I've heard your album and it's better than good," referring to the album Black Out by Kasher's band, The Good Life, released in 2002 on Saddle Creek Records. Furthermore, Oberst later sang backup on the song "Staying Alive," from Cursive's 2003 effort The Ugly Organ. Kasher temporarily disbanded Cursive after the departure of guitarist Steve Pedersen (who left to pursue a law degree at Duke University and now leads the Saddle Creek band Criteria). Kasher married and moved to Portland, Oregon. According to interviews, Kasher went through a bitter divorce in 2000, which led to the regrouping of Cursive, as well as providing the inspiration for The Good Life album Black Out and Cursive's Domestica. The Good Life was originally planned to be a solo project. Kasher wanted to experiment with different types of lyrics and melodies. He released Novena on a Nocturn on Better Looking Records. He then recruited Ryan Fox, Roger Lewis and Stefanie Drootin into the band and released Black Out, Lovers Need Lawyers EP and Album of the Year. In 2002, Kasher suffered a collapsed lung and was forced to cancel all US tour dates at the time. Because he lacked health insurance, Saddle Creek asked fans for donations to help pay for the cost of the operation. After healing, recording on The Ugly Organ began. The Good Life's fourth full-length album, Help Wanted Nights, was an album which Kasher wrote as a soundtrack for a screenplay which he started writing in 2006 and has since finished. Help Wanted Nights was released on September 11, 2007. In 2007, Kasher moved from Omaha to Los Angeles, California. While also working on new music with both Cursive and The Good Life, Kasher has recently taken up writing screenplays. In the fall of 2009, Kasher relocated to Montana to focus more explicitly on his writing. His first solo album, The Game of Monogamy, was released on October 5, 2010 on Saddle Creek Records. During his years with Slowdown Virginia and early years with Cursive, Kasher played a silver Gibson Corvus II guitar. Once this guitar fell into disrepair he played a Gibson Les Paul, he has also used a Gibson RD in the past, but has recently been using a Gibson Melody Maker. The follow-up to his first solo album, Bigamy: More Songs from the Monogamy Sessions, was released on August 16, 2011 on Saddle Creek Records. It includes songs he wrote while touring for The Game of Monogamy. The album is only available at tour venues and online through the Saddle Creek Records webstore.